In 2011 the Bemis Center’s Community Arts Program collaborated with Project Harmony on the development of their campus-wide artwork master plan for their new headquarters, located at 11949 Q St. in Omaha. Bemis Center managed the International Request for Artist Qualifications, oversaw the commissioned proposals and artwork fabrication. 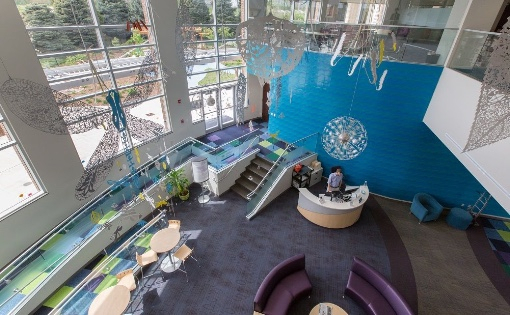 The work sought to infuse the nonprofit's mission to end child abuse, with quality art that creates a positive environment of safety, healing and caring for clients, staff and partners. Glass Murals, Building Enterance | Meg Saligman, Philadelphia, PA Saligman will create three entrance-specific glass murals using laminated and printed glass techniques. The designs will be generated from community workshops with schools and agency partners. The murals will aid in wayfinding and be the first point of experience for clients, staff, and visitors informing them of an inviting and welcoming environment before they even enter the facilities. Boroson and Hassenfeld will create a nature-inspired installation hung from the two-story central atrium ceiling filling the space with whimsical, comforting, and recognizable forms. The forms will be fabricated from anodized aluminum in calming soft green and blue hues. Zhu will create a 500 sq. ft. ocean-themed LEGO mural that will cover an entire wall leading clients from the entrance of the central atrium into the main client waiting room. The calming effects of water combined with the iconic charm of LEGOs will appeal to kids of all ages. It will be complemented by a smaller interactive version located within the “Children’s Cove” waiting room. Meg Saligman was born in Olean, NY. She painted her first mural in 1989 in Philadelphia, Pennsylvania. Since then she has worked on murals nationally and internationally, including Omaha’s 32,500 sq. ft. Fertile Ground Mural, the largest public art project in the history of the city. In 2006, Saligman was featured as one of the ten most influential muralists of the past decade in the national publication, Public Art Review. She has received numerous awards that include honors from The National Endowment of the Arts, The Mid Atlantic Arts Foundation, The Pennsylvania Council on the Arts, and Philadelphia’s Leeway Foundation. Lee Boroson was born in Stamford, CT. He attended the Philadelphia College of Art and received his BFA degree from the State University of New York, New Paltz. In 1989, he received his MFA from Indiana University, Bloomington and attended the Skowhegan School of Painting and Sculpture that same year. Boroson has exhibited his work in solo and group shows across the country. A former Bemis Center resident, his work has been reviewed in numerous publications including The Village Voice and Sculpture Magazine. Kirsten Hassenfeld was born in Albany, NY. She received a BFA from the Rhode Island School of Design in 1994. She went on to receive MFA from the University of Arizona–Tucson, in 1998. Hassenfield has exhibited her work in solo and group shows across the country, including the Bemis Center. Hassenfeld was awarded a grant from the Pollock-Krasner Foundation in 2006 and was recently commissioned to create a project for the New York City Department of Cultural Affairs. Ying Zhu was born and raised in China. Prior to earning her bachelor’s degree in Management Information Systems, she studied photography at China Communication University in Beijing. She received an MFA from University of Nebraska-Lincoln, and was a Bemis Center resident in 2011. Zhu has exhibited her work in solo and group exhibitions across the country. The artist lives and works in Omaha, NE. Project Harmony’s mission is to protect children, collaborate with professionals and engage the community to end child abuse. The organization’s motto: One Child…One Place…One Time informs their approach. To respond to the abuse of children One Child at a time, professionals from Project Harmony, Child Protective Services, law enforcement and the medical community come together at One Place, so that a child only has to tell of his or her abuse One Time. Since its inception in 1996, Project Harmony has served the needs of more than 14,000 children and their non-offending family members, provided training services to over 13,000 professionals and has been recognized nationally as a best practices model for the response to child abuse and neglect.